The Government of A.P has released RC.No.6/RC No 6 on 17th November,2016. 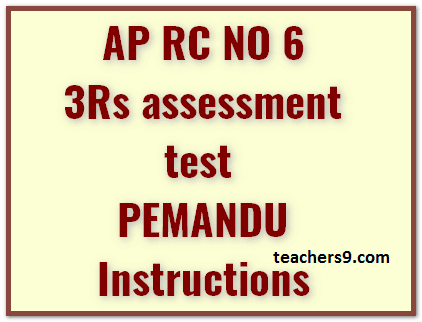 As per This AP RC No 6/AP RC.No.6 PEMANDU lab initiatives - Conduct of 3Rs assessment test to 2nd to 5thclasses as a part of Formative Assessment3-Certain instructions issued. As a part of implementing PEMANDU lab initiatives read PEMANDU lab draft report, Govt., of Andhra Pradesh vide Govt. Memo dated31.10.16 has directed Commissioner School Education& SPD, SSA, to conduct 3Rs (Reading, Writing and Arithmetic) assessment for students from 2- 5 classes in Telugu, English and Mathematics. In the above context, it is proposed to conduct 3Rs Assessment Test tentatively on 28.11.2016, in place of Formative Assessment3 (FA3) for the students of Classes 2 to 5 studying in Primary and Upper Primary schools, under all managements, including Govt., and Private Aided and Unaided, in Andhra Pradesh. The twin objectives of conducting 3Rs Assessment is to assess the learning levels of primary school students in AP State and to facilitate 3 R remediation/supplementary teaching for those identified for low performance. While the 3R Assessment Tool will be provided from State level, the valuation of the same will be done at the school level by the teachers. On completion of the 3R Assessment and obtaining the analytical reports, it is proposed to provide intensive remediation to such students who need the same and who are studying in Government managed schools. The remediation program to be delivered to them will be designed by SCERT based on the analytics of the 3R Assessment. Private schools management may also be encouraged and instructed to conduct the required remediation program for low performing students. It is expected that the learning outcomes of students who had undergone the remediation will show improved performance in the Summative Assessment 3 (SA3) in April 2017. If required, students needing further remediation will be provided the same during the summer vacation 2017,so as to make them better prepared for the next higher class. 3Rs assessment test will be conducted for classes 2 to 5 in Telugu, English and Mathematics in place of Formative Assessment - 3 (F.A - 3) that is scheduled to be conducted later in November 2016. 3Rs assessment will test Telugu, English and Mathematics subjects of Classes 2 & 3 and English of classes 4 & 5. Telugu and Mathematics of Classes 4 and 5 are to be assessed by another standardized tool. The 3Rs Question Paper will be provided by SCERT. The 3Rs Assessment will be conducted by the School Teachers in their respective schools only. The Head Masters/Principals should get the papers evaluated by jumbling the duties of the teachers with in the school. In case of Single Teacher Schools, care should be taken to validate 5% of the Assessments done by external evaluators. The marks of 3Rs assessment in each subject should be recorded under slip test category of F.A- 3 in CCE records and registers. Though the 3Rs question paper will contain more than 20 questions, the teachers will have to proportionately reduce the marks to 20 while posting under slip test. The subject Environmental Science (EVS) for classes 1 to 5 shall be conducted with teacher prepared question papers. Separate instructions will be issued along with the 3Rs Assessment & additional Standardized Tool on the procedure to be followed for conduct of test. The 3R Assessment results shall be uploaded online using AP online services. The results would be used to diagnose the students who need remediation, and the remediation programme will be conducted subsequently in the coming months. So, For further clarifications about 3Rs assessment test instructions in AP Rc.No.6 , you can contact Sri. A. Satyanarayana, SCERT, Mobile No: 8897966414, Dr. Prasada Rao, SSA, 7702775136.